What's included in the X-Arcade™ Machine Cabinet? Do I have to setup anything? Does it work like a regular arcade machine? What is the size of the machine? Can I use it with MAME™ as a MAME™ Cabinet? Can I use with my existing games or game system? Can I play with new games? How do I change games? Will I be able to use with Xbox™ 360? Can I play "this game" with the machine? I've seen machines with thousands of games, can I get one of those? How does the X-Arcade™ Machine Cabinet compare to a "real arcade machine"? How does it compare to MAME Arcade Machines? Why should I buy the X-Arcade™ Machine Cabinet instead of this other machine? Will you be coming out with different control panels? What kind of joysticks do you use? What size and type of monitor is in the X-Arcade™ Machine Cabinet? How do I get it into my house/building, can I get help bringing inside? How long till I get it? Can I Purchase The Cabinet Without The X-Arcade? Can I phone in an order? Can I get it without monitor or other part? What's included in the X-Arcade Machine Cabinet? The X-Arcade™ Machine Cabinet was designed to work immediately without any complicated setup. You'll need to connect it the control panel, (it ships disconnected so your machine will fit through any door) but that step and the connection of 4 cables to the Arcade PC takes about 10 mins. Then, just plug it in, turn on and go! The X-Arcade™ Machine Cabinet is modeled from an industrial-grade, coin-op arcade machine. You'll get the exact same thing as the arcade, but we made some upgrades so the machine would look great and function well in a home or place of business. It uses all the same parts as a real 80's arcade machine. No coins are required to start games (just press the pinball buttons on the side) and everything is controlled from the X-Arcade Tankstick. The machine does include a working coin-door, but you can simply add credits to games by pressing the side pinball buttons. Real arcade machines typically cost upwards of $3000-$5000 each and only include a very limited number of games and no flexibility. You control games just like you would on a regular game console, but use the controls of a real arcade machine. This makes adding new games from your favorite game system as easy as inserting a game disc and pressing the power button. Can I use it as a MAME™ Cabinet? With the popularity of MAME™, many people who grew up on the classic arcade games from the 70's and 80's want to relive these games today and your X-Arcade™ Machine Cabinet is 100% compatible with all versions of MAME™ and all emulators with built-in arcade gaming software. Due to the legal implication of game roms, we cannot provide any information, advice, help, links or answer any questions about where to download roms or games. Please note the legal implications of using MAME ROMS you do not own. Order online or Call 1-866-747-1233 for details. The X-Arcade™ Machine Cabinet electronics include a lifetime warranty. The Cabinet/Machine, game system and monitor are covered for one year. Since the X-Arcade™ Machine Cabinet was designed for home and office use, all the parts can be replaced onsite by your grandma. Unlike competing arcade machines, the X-Arcade™ Machine Cabinet will NEVER need on-site service by a skilled technician. We focused on making the X-Arcade™ Machine Cabinet easy to fix. Where would someone install or use an X-Arcade™ Machine Cabinet? Since the X-Arcade™ Machine Cabinet replicates a real stand-up arcade machine, customers from all walks of life are using units in very interesting ways. In the home, the most common use is in a gameroom, home theater room or man-cave: serving as the centerpiece of the ultimate gaming experience. Outside the home, the X-Arcade™ Machine Cabinet is currently being used in university rec-rooms, break rooms, waiting rooms, corporate offices, any place you want to add some fun for visitors, guests or employees! The machine can currently be found at the nations's most prestigious Universities and successful Corporations. 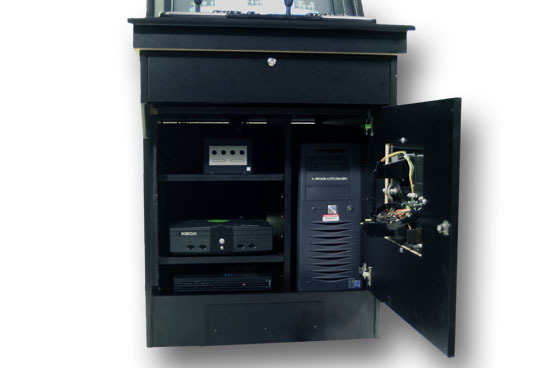 The X-Arcade™ Machine Cabinet is a great solution due to its industrial-grade parts and lockable access areas. Where can I store my games and movies? We came up with a brilliant way to access your games and movies using a simple pull-up system attached behind the graphical marquee. Just push up the front of the marquee and access this hidden storage area! Currently, 250+ Classic Arcade Games are included. View the complete list of games here. This is by far the largest legal collection of classic games available for any arcade machine. Unlike other machines, you don't need to purchase expensive game packs to upgrade either.r. You can connect your favorite game system to the X-Arcade™ Machine Cabinet and control those games with real arcade controls. When you compare the X-Arcade™ Machine Cabinet to a smaller and less-equipped cabinets, it's important to realize the X-Arcade™ Machine Cabinet also has the incredible flexibility of supporting 10 different game systems and thousands of game console titles, with no need to purchase expensive game packs. Just plug in your game console and control your favorite games with our arcade controls and watch on the arcade machine. If your friends prefer playing certain games with a game pad, the X-Arcade™ Machine Cabinet supports the option to use either the X-Arcade Arcade Joysticks or your favorite game controller. We provide a 4-way switch box to connect multiple game systems. You can also connect your computer or game system to the X-Arcade™ Machine Cabinet and control those games with real arcade controls. When you order, just let us know which system you have and we'll include the special adapters so you can connect to that system at no charge! Just plug in your game console and control your favorite games with our arcade controls and watch on the arcade machine. Your X-Arcade™ Machine Cabinet is the most flexible arcade machine available and supports the widest range of games and game systems. X-Arcade™ is the real thing, everything else is just an imitation. There a single game menu for accessing your games. Will I be able to use with PS4 or XBOX ONE do I change games? Yes we've developed a great reputation in the game industry by creating products that you buy once and use forever! It's a simple idea that we take seriously. Just plug the game system to our video and audio control box, then connect your game system to our machine controller and you are off. The whole setup will take about 5 min! Can I get an arcade machine with thousands of games? If you see an ad for an arcade machine or MAME™ machine claiming it includes THOUSANDS of CLASSIC MAME ARCADE GAMES, it is not possible to legally obtain licenses for that many games. You will not get an arcade machine from us which includes thousands of games and any company selling such a machine will not be in business for long. See how you can easily add your own games or game console to your arcade. Can I play Pacman ™? Yes, it's included in the basic game package on the Namco™ Museum Game Compilation Disc. How does the X-Arcade™ Machine Cabinet compare to a REAL arcade machine? Unlike other arcade machines which are built by kitchen cabinet makers or garage operations, ours are built by professional arcade experts with decades of experience building commercial arcade machines for the largest arcade manufacturers in the world. This IS a commercial-grade arcade machine. Take a close look at the dimensions and weight of any alternative. Our machine is 75 INCHES tall and weighs 400lbs. It is built like a tank and the most authentic arcade machine available. In fact, the only differences between this machine and an arcade machine found at your local arcade involve cosmetic and electronic upgrades we've made. Specifically--adding storage space for your game systems and games, a keyboard drawer, lockable drawers/doors, adjustable marques and shelving for anything you want to add in the future. You'll get a real arcade machine--that's flexible and upgrade able. How does it compare to MAME™ Arcade Machines? The X-Arcade™ was made for arcade enthusiasts and owes its birth to the legions of MAME™ users all over the world. Our system is by far the best choice for MAME™ users not wishing to build their own cabinet. Why should I buy the X-Arcade instead of _______? There a number of factors which created our leadership position in home arcade gaming. Authenticity: The X-Arcade Machine is by far the most durable and authentically produced arcade available. Innovation. We were the first gaming company to develop and market a single arcade machine and joystick to work with any game system. We took the fun and simplicity of classic arcade gaming and are making it available to any game system or platform. No other machine can offer this functionality, which we consider incredibly important given the large investment you are making and the planned length of time this machine will be in your home or office! Your X-Arcade™ Machine Cabinet is future-proof. Flexibility. We had enough foresight to realize--as game systems become obsolete, the arcade machine you love doesn't have to. We designed the first and only arcade machine which can be purchased today and include future support for new game systems. No one wants to buy a product or technology which becomes obsolete. Our system includes the classics, plays thousand of arcade games, but is compatible with your favorite game console, Mac™ or PC. In the future, when a new Xbox or Playstation or Nintendo is released, you will be able to buy connections to play that game system inside your X-Arcade™ Machine Cabinet for $50, that's a great value! Service. Your X-Arcade™ Machine Cabinet is indestructible and so is the warranty that comes with it. Focus. We became the top-rated arcade hardware company on the planet by focusing our efforts exclusively on arcade gaming. You wont' find us making gamepad's, steering wheels, dance pads and every input device under the sun. We are passionate about classic gaming and focus all our resources in this area. X-Arcade™ is the real thing, everything else is an imitation. Currently, we offer a two player control panel with a trackball in the center, but are well-ahead of our competition by featuring a "fully-removable" control panel. This design concept is important because it allows your X-Arcade™ Machine Cabinet to be very flexible when it comes to future additions and gameplay. This means you have the option of purchasing additional control panels in the future as they are made available to expand your machine to support more players and new types of game play. You can proceed with purchasing the standard 2 Player configuration now and we will notify all owners of new panels as they are made available. You can even design your own custom control panel and attach to your X-Arcade™ Machine Cabinet. No other arcade machine cabinets offer this kind of flexibility or value. What kind of joysticks/buttons do you use ? The joysticks used in the X-Arcade Machine are manufactured by Xgaming and industrial-grade (8/4 way) tested to work for 10,000,000 pushes. The 8 way mode is disabled for any 4 way game like Pac Man for ultimate performance. What if something breaks ? The design of the X-Arcade™ Machine Cabinet was structured to make it extremely easy to service. In most cases, you'll be able to easily fix the problem on-site with no technical help needed. -If the controller itself fails, it's removable and replaceable on-site by anyone WITHOUT technical experience. Unplug and change, very simple. Your computer has built-in WIFI and a remote login application so we can provide remote diagnostic services and update your machine if necessary. -You can remove the game system and audio speaker system in a few minutes and change out with a replacement supplied by Xgaming. Anytime you run into a problem, call our Toll Free Support Line and speak to a human! 1-866-942-6464 or fill out a case form here. The X-Arcade™ Machine Cabinet joystick, buttons and trackball include a lifetime warranty. The monitor is covered for one year. You're spending thousands of dollars for an authentic arcade experience and we back that investment up with unparalleled service! If you have a problem with your X-Arcade, we will remotely login and troubleshoot/fix any problems for you. No need for an on-site technician. Just make sure to have WIFI Internet so the machine's built-in WIFI card can get online. We'll bet other arcade games you're looking at do not have this nifty feature. What size and type of monitor is in the X-Arcade Machine? Don't be fooled by arcade machines using tiny 21" Computer monitors or even those brave enough to use a television as the main display. We include an adapter to connect any game system to this VGA monitor. Your X-Arcade™ Machine Cabinet will ship from Chicago, IL via freight. It's pre-assembled and ready-to-use. No, you cannot pickup from our facility. How does is ship ? Your X-Arcade™ Machine Cabinet ships on a palette via truck-freight, pre-built, assembled and ready to use. The entire bundle weights approximately 400LBS, so make sure to have a furniture or appliance dolly and friend there to get inside your house. For an additional fee, the freight company can bring upstairs/downstairs inside house or building. There are special requirements for where and how inside delivery is made, this will be arranged by phone before your machine is shipped. Canada is $699, but for any other countries, you must arrange your own pickup at our facility and incur a $300 crating charge. Call 1-866-747-1233 or send us an email to request a shipping quote. How do I get it into my house or building? Your X-Arcade™ Machine Cabinet ships on a palette and we suggest you have one-two friends (just buy em' some beer) and a furniture dolly ready to move to its desired location. *There are wheels on the back of the machine so you can tilt and push around from room-to-room. How long till it ships? Your X-Arcade™ Machine Cabinet is high quality furniture, but if you place your order today--it will ship within 1-2 business days and arrive in approximately 5-7 business days via freight. What if it's damaged in shipment? If your X-Arcade™ Machine Cabinet arrives damaged in anyway, you must refuse delivery. Since it ships via Freight, you must carefully inspect the outside box to ensure it was not damaged in shipment. Can I purchase the cabinet without your X-Arcade™ Joystick ? If you already have an X-Arcade™ Joystick, please call to place your order. Call 1-866-747-1233 or send us an email for special requests. You can also order the machine online and reply to the order confirmation email and request removal of the joystick from your shipment. Call 1-866-747-1233 to phone in and order or ask any questions. You can also click on the LIVE HELP icon on the left side of our site (M-F 8-5). send us an email for special requests. Can I order without the monitor or other parts? Please Call 1-866-747-1233 or send us an email for special requests.